"If the BJP wanted to indulge in horse-trading to form government, then it would have done so during the six-month Governor’s Rule", the Home Minister added. 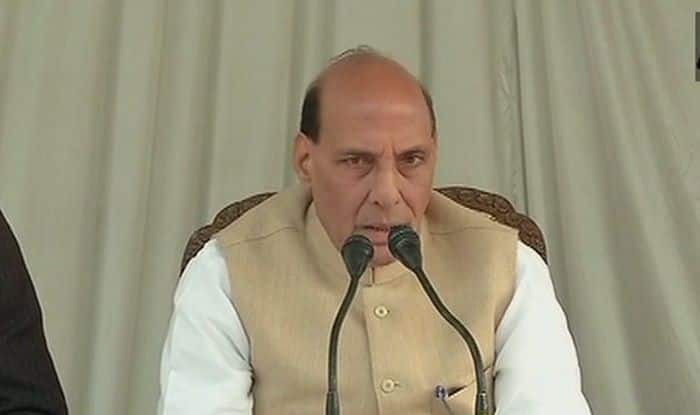 New Delhi: Union Home Minister Rajnath Singh said that the government was ready to hold Assembly elections in Jammu and Kashmir at any time.”If the election commission would decide to hold elections, the Home Ministry would offer requisite security for the conduct of free and fair polls,”said Singh, while speaking in Lok Sabha on Friday. Responding to a discussion on the resolution on a presidential proclamation about imposition of President’s Rule in the state, Singh also rejected claims of some opposition parties that the BJP was propping up a regional party to form government. As Singh was speaking, National Conference leader Farooq Abdullah interjected, saying, “The PDP approached our party and we agreed to provide them support along with the Congress. But the irony was that the fax and phone of the Governor was not working.” Abdullah asserted that the Governor’s House is not the place to prove majority and it is the floor of Assembly here the government of the day has to prove its strength. The Home Minister said that no party was in a position to form government in the state even a day before December 19 when the Governor had to take decision about dissolution of the Assembly. “Our intentions should never be doubted on Jammu and Kashmir. If the BJP had to form the government, we could have done it within six months of the Governor’s Rule,” he said. The Home Minister said the then Governor N N Vohra had sent a report in June after speaking to leaders of all major parties that none of them had expressed any intention to form a government. He asserted that the Central government would take no wrong or immoral action in the state. “We are totally committed to democratic process,” he added.